Homeopathy is a system of medicine based on the principle that a disease with a given set of symptoms can be cured by a medicine (remedy) which is known to produce a similar set of symptoms. This principle where “like cures like” is called “The Law of Similars” and is the foundation of Homeopathic Medicine. Homeopathy involves the selection and prescription of a medication (remedy), which through prior testing on healthy people and from clinical experience and observation, is known to produce a similar symptom picture to that of the patient. The medication (remedy) is prescribed in the minimum dosage required to bring about (stimulate) healing. Homeopathy is a system of medicine practiced and proven worldwide for hundreds of years. The emphasis is on the treatment of the individual as a whole and unique being. Homeopathy recognizes and emphasizes the importance of the body’s individual way of expressing and coping with “dis-ease” and works with it to restore health. Homeopathy approaches the goal of restoring health based on the philosophy that symptoms are the body’s way of expressing a deeper internal imbalance. To address your particular situation the mental, emotional, physical and environmental factors are considered. Based on an in-depth assessment, your Homeopath will develop a health plan specific to your individual needs. Homeopathy acts to stimulate and support one’s own innate healing ability thus eliminating disease and restoring overall wellness in the most natural way possible. 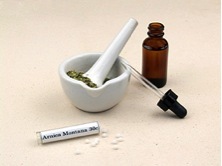 Homeopathic medicines are derived from natural sources and are safe and non toxic. Homeopathy can be used safely with infants, pregnant women, the frail and yes, even your furry friends. This form of natural medicine can be used as a primary or complimentary therapy as it works to enhance the benefits of most other forms of conventional and natural treatments. Homeopathy acts on a wide range of physical, mental and emotional disorders even when the origin is unknown or occurred some time ago. Homeopathy can provide deep, lasting relief and overall long-term wellness. Human beings are organisms of body, mind and spirit functioning in total harmony (homeostasis). A healthy organism will keep itself healthy and if injured will act to repair the damage. Throughout this process of self-correction, the individual produces symptoms. To a Homeopath, these are not the signs of ill health, rather an indication that the healing process is under way. Symptoms are a guide to appropriate remedy choices; they are a guide to how well the healing process is proceeding and they are a guide to ongoing treatment and assessment. Homeopaths understand that nothing can be known about disease except what is seen in the symptoms and nothing can be cured except the symptoms. Symptoms show the disturbed patterns. Homeopathic Medicine addresses these disturbances. This is the realm and the particular expertise of this powerful system of medicine. Case taking is a diagnostic tool unique to Homeopathy. The first consultation with a new patient, which generally takes from one and a half hours to two hours, is called case taking. Through this case taking process the Homeopath gives the patient freedom to express his or her symptoms without disturbing the flow of information. Promptings at this point in the case taking will only be encouragements to say more and to ask what else is relevant. In this way, the patient identifies the problems for the doctor within his or her own frame of reference. This is extremely valuable information for the Homeopath as prescribing a remedy is based on the unique symptoms as opposed to the common symptoms of illness. For example, a Homeopath may see 12 patients with arthritis in a two-week period. It is very likely that each of those patients will receive different remedies. Although all the patients will have in common the typical symptoms of arthritis — stiff and painful joints, reduced mobility in affected joints, etc. — the prescribing of homeopathic remedies will be based on the unique symptoms of the illness. One patient may have arthritis in the small joints of the left digits, and her pain is worse on waking, and she feels better throughout the day with use. Another patient with arthritis in the left hip joint and affecting the knees and ankles, feels fine on waking but gets progressively worse throughout the day. A third patient has an arthritic right ankle joint, which buckles with extended use and feels better with hot compresses. Another patient may have developed arthritis shortly after the death of his wife. Homeopathic will use these unique symptoms, and many more, to gauge the appropriate remedy for each particular patient. The mental state of a patient is of critical importance for a homeopathic assessment. While these examples are simplistic, they do outline the general approach to prescribing and working with patients. Case taking, then becomes for the patients, a process of awareness and exploration of their own unique experiences. Homeopathic patients become partners with their Homeopath in noting progress and identifying areas that need work. A Homeopath must be an excellent listener and observer to effectively treat his or her patients. In the case taking process, once the patient has provided all the information in his or her own words, the Homeopath will address the myriad of areas where information is required: medical, personal as well as family history, in the more traditional sense. In this way, the homeopathic assessment and diagnosis takes place. A powerful relationship develops between patient and Homeopath and much healing takes place within the context of this caring relationship.